This reveal is especially sweet because this project not only achieved its goals with the look and ambience created within the space, but how it functions was dramatically improved, too. 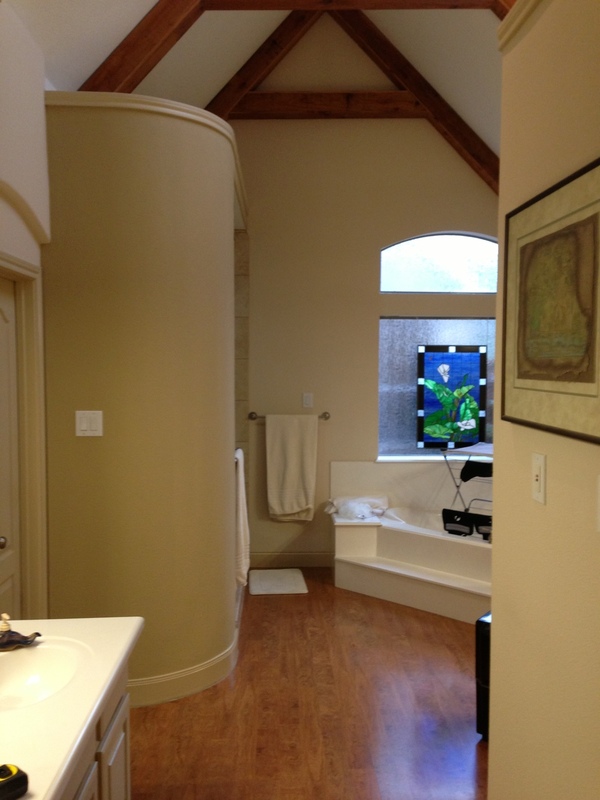 This homeowner needed a more functional bathroom for the long-term; function that gave her ease of movement and a greater comfort level in her home. 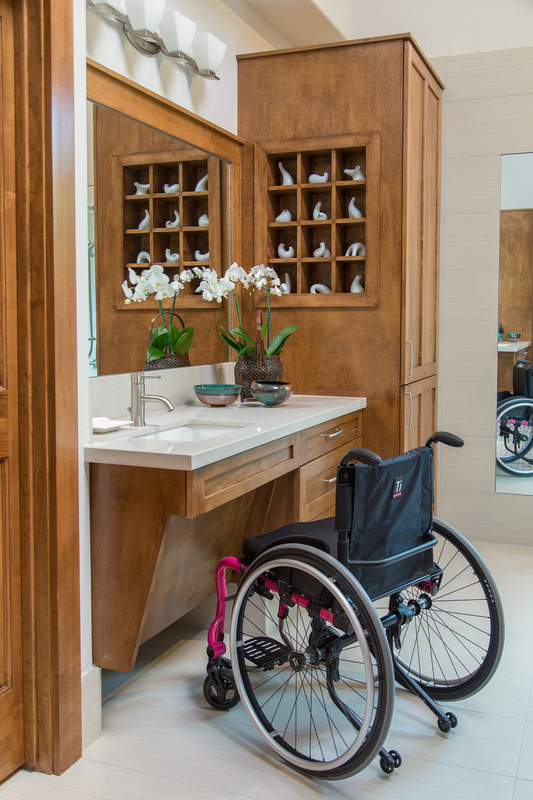 This client uses a wheelchair and had accessibility issues with her previous shower arrangement — as well as the toilet room, bathroom counter, etc. The big corner tub was taking up lots of space and went unused, except for drying racks that were stashed there — which is something I see a lot in many homes. (Cat litter boxes, too. :-). 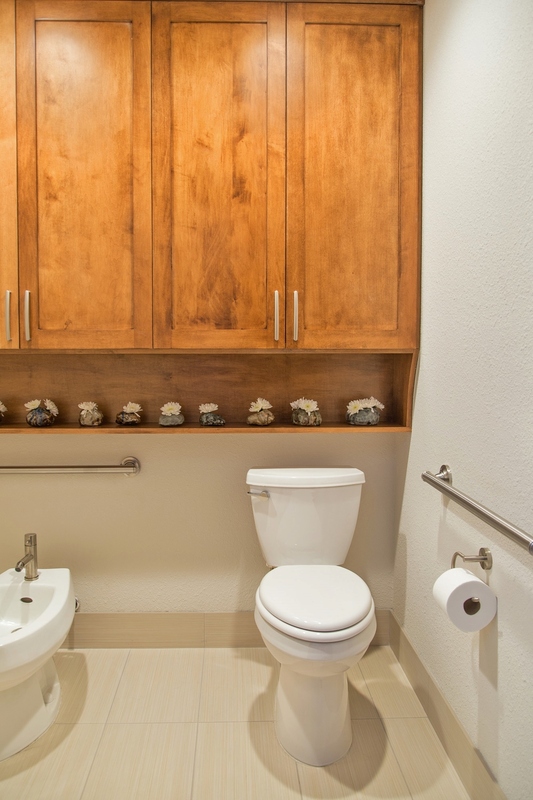 So, if you’re not going to use that giant tub of yours… Take it out to make room for a more useful space! These clients were an absolute delight to work with. In this situation we needed space for the wheelchair to maneuver. And a large, wide toilet room so that entry was easy and accessible. You can see the bench that we opted for in the shower. In both of the bathrooms I’ve done for people with accessibility issues, a floating bench or seat has worked better for them than building something in. It gives more flexibility and, frankly, it just sits more comfortably than a tiled seat in the shower. I like the look of the teak wood, too; it works with our aesthetic so well. We also did a barn door style glass enclosure. 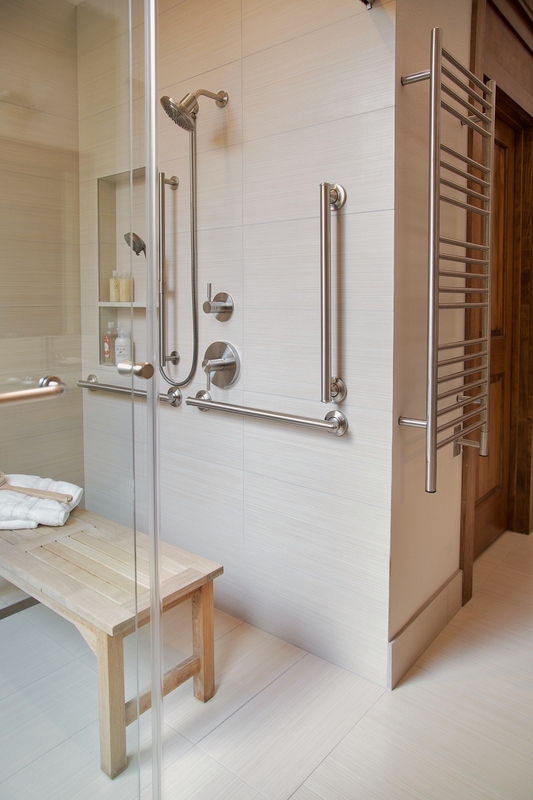 It works really well in this situation; a wide glass door would’ve been too heavy to open, and we needed width in the entry of the shower. 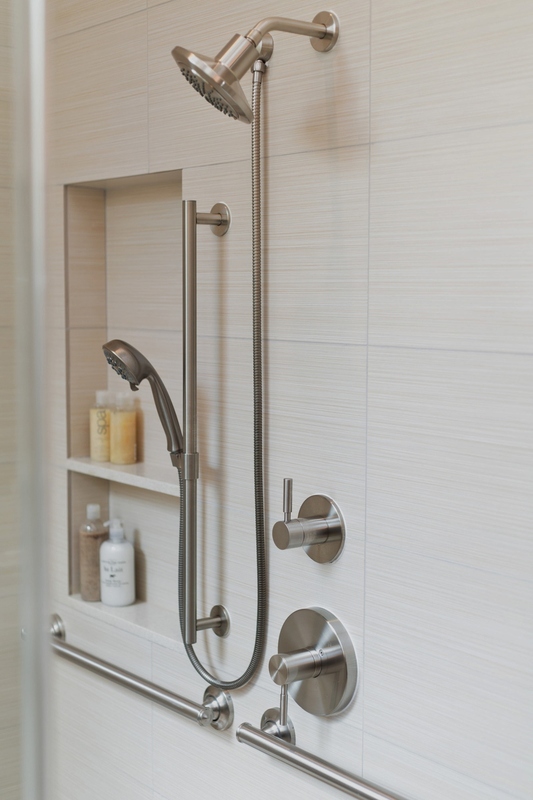 Many people opt for open showers when accessibility is an issue; and while this is certainly an option, many times people complain of how they make them feel a bit chilly, especially when help is needed in the shower. Keeping the shower enclosed with a door helps keep the warmth in a bit. 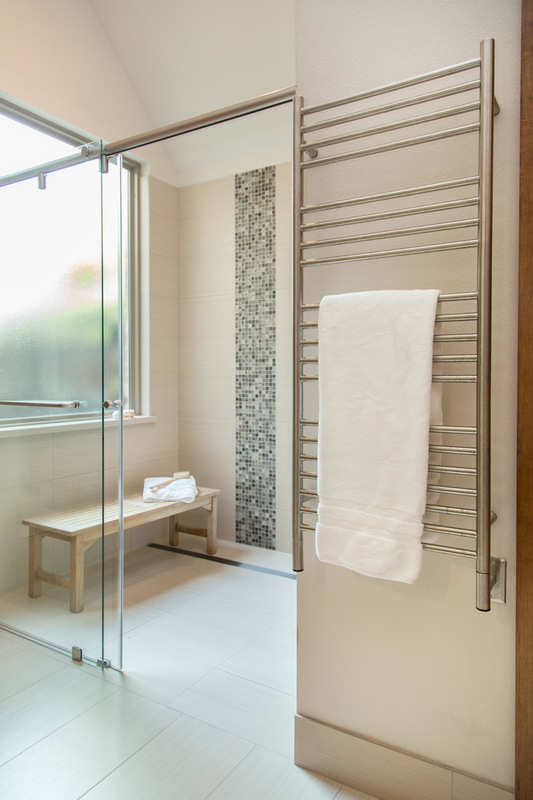 I love how the line of the shower enclosure continues the line of the wall. Overall, the space feels deeper. And as you enter it you naturally sense there to be a sweet surprise right around that corner where the light pours in. We also did a linear drain, with a slight sloping to the back of the shower. 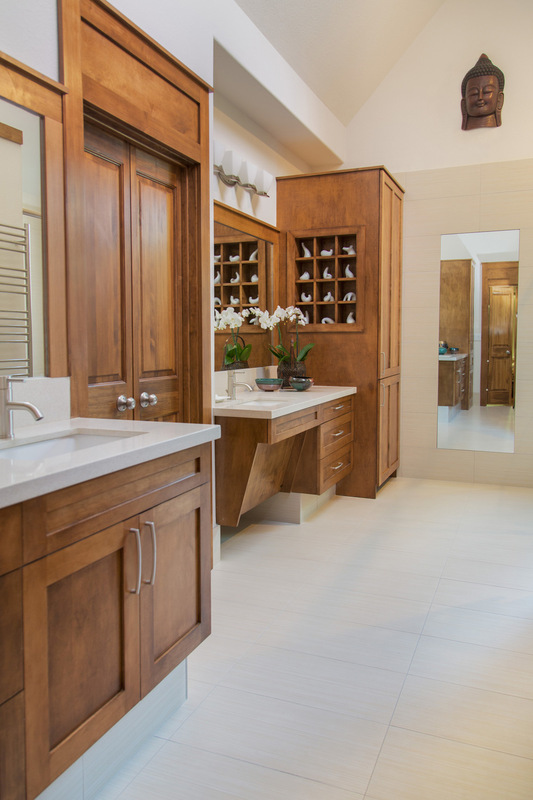 I just love the clean look, and it works so well with our design, both functionally (as it allowed us to go curbless) and aesthetically (as it adds to the sleek, unencumbered style). 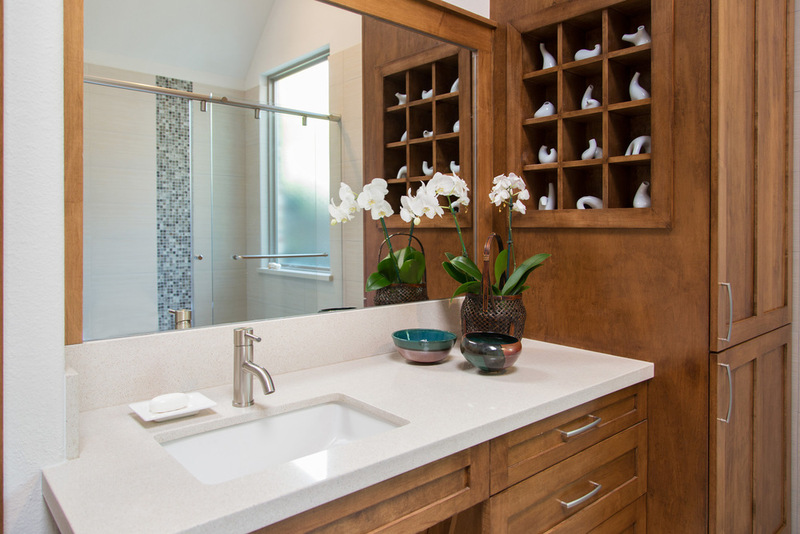 Also in the mix were some custom features that are similar to what we put in many luxurious bathrooms, such as a towel warmer in just the right spot as you’re coming out of the shower; beautiful, low-maintenance materials; a concealed drying rack; and a place for special collections and art — all of which combined to create a Zen-like ambience. 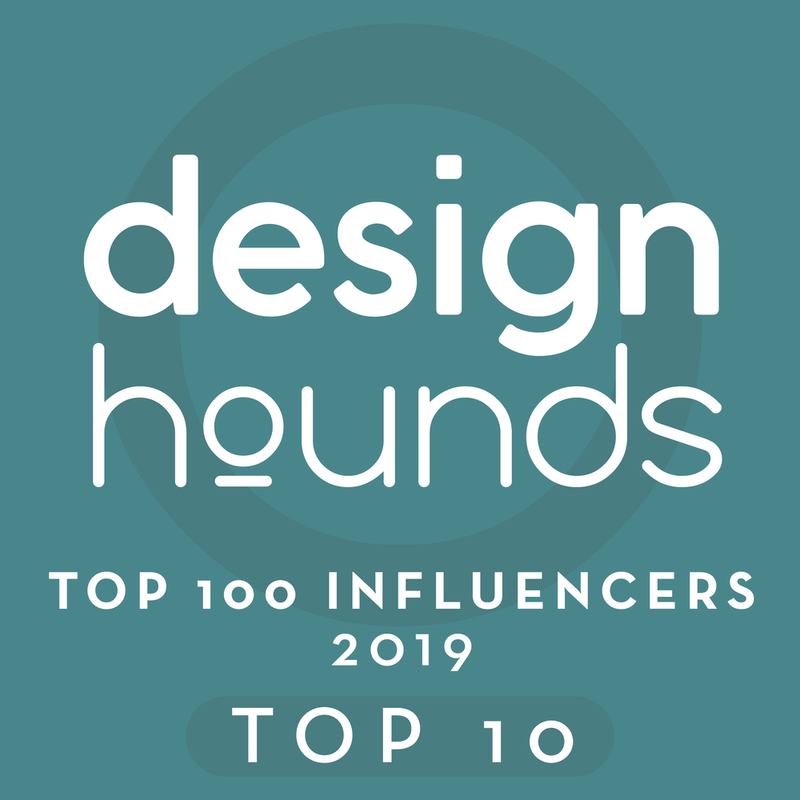 if so, subscribe to DESIGN REFRESH, my bi-weekly newsletter featuring design tips & tools that will have your home looking fresh and new in no time! 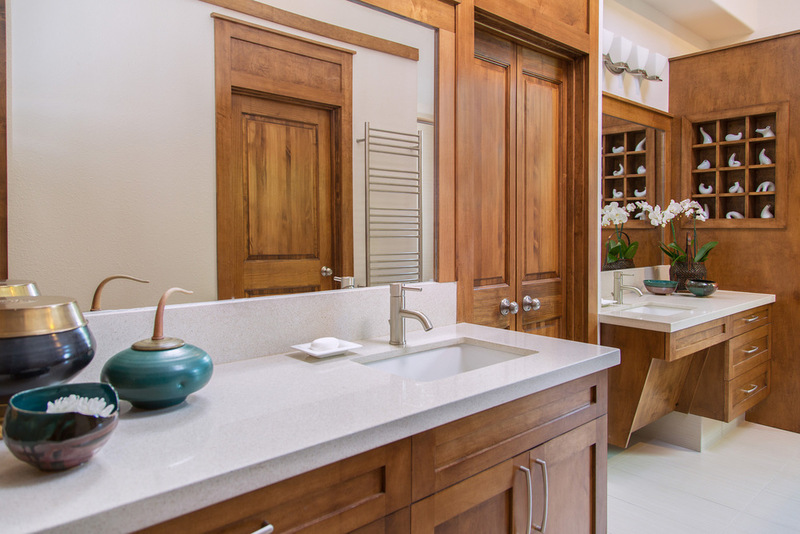 This bathroom remodel achieved the spa-like feel we were going for. And, more importantly, the homeowner now has an ease of movement in the space that she didn’t have before, making her home more comfortable and long-lasting than it’s ever been. 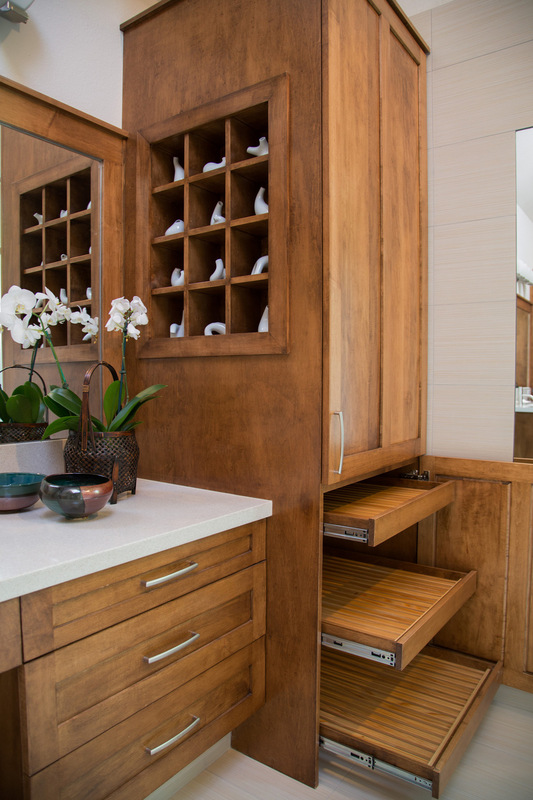 Every inch of this remodel was custom designed for functionality and beauty to create a space that will nurture and offer respite for years to come.